After a very few hot days, July 31st promised to be a lot cooler, so Jan and I decided to go hiking… just in time for me to sneak it in for July’s contribution to take 12 trips ;-). Jan suggested heading bit further afield than we had on previous hikes and mentioned Delémont, so I looked for a hike that started there and found one that took roughly 2 hours and went up the hill beside the town. We were supposed to come past the Chapelle du Vorbourg and the ruins of Vorbourg castle, but the route description wasn’t very good and somehow we missed them. Oh well. Having difficulty following the instructions I had printed, we decided that the place where we were must have been where it wanted us to start heading up through the trees. In hindsight, we were wrong since we never did come across any chapel! We did, however, eventually find a break in the trees from where we could look down on the town. Just up the hill from there was a proper viewing platform, so I had shoved my way into the gap between the trees for nothing! With all the rain, the snails were out in full force. We had to be careful not to tread on the ones that were hanging out in the middle of the path! How pretty is that shell though? After admiring the view, we headed back down the mountain and towards the old town. Pretty much as soon as we were away from the woods the sun came out! The whole old town was full of flag bunting. I’m not sure whether it’s always there or they had hung it up specially because the next day was the national holiday. I only recognised two of the coats of arms – the one for Jura and the one for Delémont town. You can see both of those on the first picture below. The others are presumably from the other towns that belong to Delémont district? Jura flag and Delémont flag at the front. Not sure what the church-looking one is. Delémont flag at the very back left! Jura flags… although one seems to be backwards? DOn’t know what the blue one is. The old town of Delémont is small but very pretty and we had a nice wander round in the sunshine. Too soon it was time to head back to the train station – we were meeting people to watch the fireworks and wanted to shower first. We grabbed some tasty food from the station café and a beer from the little Coop supermarket at the station and ate and drank those while waiting for the train. This is a nice little hike for a day that you don’t have time for a longer one (just make sure not to miss the chapel and castle like we did!) and Delémont old town is worth a look at, although it’s so small that I wouldn’t make that the entire itinerary for your day trip! Monday Escapes has been revived with new hosts, so I’m linking up with Travel Loving Family, Extraordinary Chaos, Tin Box Traveller and Mini Travellers for that. And of course I’ve already mentioned that this was my July trip for #Take12Trips, which was originally the brainchild of Clare at Need Another Holiday. At the end of June, my mum and brother came to visit for a few days. I wanted to take at least one trip outside Basel with them, so on the Sunday we went to Zurich and the Rhine Falls. If you take the boat make sure you wear something waterproof! After our boat trip, we walked around to the castle and had a look at the exhibition. It’s pretty small and basically gives you a bit of information about the history of the castle (also fairly small). Afterwards, we took the glass elevator down and had a look at the falls from another angle. Tired and thirsty after all that, before heading for the train home we went and had a beer and some cake at the castle restaurant. And of course the little birdy friend that came to join us got some cake too! Although the Rhine Falls are very touristy and – as you can probably see from the photos – pretty crowded, it somehow manages not to be too much, at least not on a Sunday in June! I can definitely recommend this as a nice day or afternoon out. 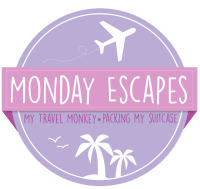 Linking up with Packing My Suitcase and My Travel Monkey for Monday Escapes, for the last time! Click the button to see lots more travel inspiration. I’m slowly catching up on blogging my Take 12 Trips adventures for 2016. With this post, I’m only two months behind! After we had eaten, we took the bus back down to the train station. After checking what time the last bus back to Brigels would be (pretty early! ), we took the train to Disentis and went in search of the accordion festival. The festival was also part festival, so we watched a number of groups play the same pieces before Jan’s colleague’s group took to the stage. This group was more professional than the others and was taking part non-competitively so they could just play without worrying about points. Even non-musical me noticed that they were much better than the others! We decided not to stay for the rest of the competition and went for a quick walk around Disentis. It turned out there wasn’t much to see and I took a grand total of four photos there! Apparently St. Andrew was there, too? Soon it was time to head back to the train station so we could catch the bus back to Brigels. Once up there, we walked around for a bit (but I took no photos because I had forgotten my memory card and had only the memory on the camera itself, meaning I was limited in how many I could take!) then had a delicious dinner at the hotel before getting an early night. We wanted to be up early the next day to fit in a nice hike before we had to go home! After breakfast the next day we headed out to catch the bus back down to the train station and from there took a train to a station called Oberalppasshöhe on the Operalp Pass, a pass high up in the mountains. We wanted to hike to the source of the Rhine, which is considered to be at the Tomasee (Lag da Toma, or Toma Lake), but the hiking paths weren’t officially open yet and there was still some snow around so we didn’t quite make it. We could see that some people had already crossed the snow and presumably gone all the way up, but my shoes weren’t quite good enough and I was scared to cross the largest expanses of snow! We had a lovely hike anyway though and ended up walking around for roughly 3.5 hours, which isn’t bad (especially since it rained part of the time)! I’ve promised Jan I will go back with him when the weather is better and actually go all the way to the lake. The Rhine ends in Rotterdam, where it flows into the North Sea, so near where the train stops at the start of the hiking trail there is a lighthouse, a smaller replica of one in Rotterdam. Apparently the replica at the Oberalp Pass is the highest lighthouse in the world. But enough rambling, I’m sure what you really want is photos! I went most of the way across this bit of snow then didn’t want to go any further… it was scary! This is the Rhine… teeny, tiny, baby Rhine! Finally it was time to be on our way. The train home took us on a beautiful route, over a gorge and then around the other side of Lake Lucerne, through Schywz (a tiny canton, but the one that gives Switzerland its name). Two train changes later, we were finally home where we went straight to bed ready for a week of work starting the next day! This first trip to Graubünden was incredibly short, but it’s okay – it definitely won’t be our last! Linking up with Packing My Suitcase and My Travel Monkey for Monday Escapes. Okay, now I’ve finished telling you about New Zealand, it’s about time I recorded my last few outings for #take12trips 2016 (in case you missed it, I’m redoing the take 12 trips challenge). I thought there were people standing outside the church, but when I got closer I saw that they weren’t real! More mini buildings… the church is definitely the Allschwil one! Once you get away from the town centre, the buildings become fairly “ordinary” and there isn’t really anything to photograph, but it was worth the trip to see the half-timbered houses photographed. There is also a water tower in Allschwil, about a 25 minute walk from the centre. For the price of 2 CHF you can take a lift up and enjoy a view of Basel, the Black Forest and other surroundings. It’s only open on Sundays and bank holidays though, and my trip to Allschwil was on a Saturday so no water tower for me! I enjoyed my trip to the centre of Alschwil, but I was left with just one question… why don’t I live in such a pretty house?! Today I’m linking up to Monday Escapes with My Travel Monkey and Packing My Suitcase. Allschwil was my April trip for #take12trips 2016. When I left off before, we’d reached the end of the Forgotten World Highway. From there, we drove to our B&B in New Plymouth, which was lovely by the way! I wish we could have had more than one night there. Before going out for the evening we admired the view from the window and took some photos of the birds out in the garden. We were later told that these are Indian Mynah birds. Our B&B wasn’t directly in town, so we got back in the car to go down to the coast then parked up and went for a walk. We walked along the coastal path for a little way. It was nice to be by the sea. Apparently I took a lot of photos of rocks? I liked the way they looked with the sea in the background. We were hungry by that stage so we headed back to a restaurant near where we parked the car. It’s called Arborio and the food we ate was delicious! We even indulged in some nice wine and had desert. We must have been feeling rich 😉 I took zero photos of said food though. Again, bad blogger. The next morning, the sun was rising when we got up for breakfast. From New Plymouth we drove up to Auckland, stopping at the Waitamo Glowworm Caves on the way. I have no photos from there because you aren’t allowed to take photos in there (and I left my camera in the car so I couldn’t have sneaked any ;-)), but I can highly recommend it! There are glow work experiences of up to 3 hours(! ), but we didn’t have that long so we did a 45 minute tour, which involved walking through one cave with a guide followed by a boat ride through the dark to the exit. During the boat ride, you can see all the little glow worms glowing away… like millions of stars on the roof and walls of the cave. A truly awesome experience that was over way too soon! Day four on New Zealand’s south island saw us deciding to take the poor, neglected car for a drive – it had been sitting around doing nothing since our trip out to Paradise the day we arrived in Queenstown! The plan was to head to Arrowtown first and then drive down to the south coast. An excellent plan as it turned out – we had glorious sunshine all day while it poured down in Queenstown! A former gold mining town located on the banks of the Arrow River, Arrowtown is mostly famous for its gorgeous autumn foliage. Unfortunately, we were a few weeks too early and the leaves were only just starting to change colour. The town itself is quaint though. Look how low the clouds were! As we continued driving, the weather got continually worse and when we stopped for a cuppa we had to run from the car to the cafe! I would like to tell you where we stopped because we had an amazing vegetable scone there, but I can’t remember the name of the place. Sorry! There’s a lighthouse at Stirling Point, which was built in 1912. There’s also some art sculpture thing, consisting of a giant chain with an anchor at the end. From Stirling Point, you can see Dog Island, which houses New Zealand’s tallest lighthouse. The island has been uninhabited since 1989 when the lighthouse was automated. I took many photos of the lighthouse, from every possible angle. I’ve spared you most of them – be grateful! We left the lighthouse and drove on for another half an hour until we reached Curio Bay, famous for being the site of a petrified (i.e. fossilised) forest. The rocks in the photos below are actually trees… or they were, once upon a time. Some kind of heron I presume? Where are all the bird experts? With a three hour drive ahead of us to get back to Queenstown, Curio Bay had to be the last stop on our tour along the south coast. Instead of driving back along the coast, we headed straight inland and took the quick route back. At some point we stopped to take photos and I got the shot below. No idea where it was taken, but I like it! Finally, we stopped again in the same place as in the morning. By this time, the sun had come out in Queenstown as well (although we were assured it had rained for most of the day). Back in Queenstown, we dropped off the car and went in search of food having had a lovely drive. With more time, I would have liked to stop off somewhere for a night and then drive further around the south coast, or maybe even take a boat trip out from Bluff to Stewart Island, but this was a lovely day trip. If you find yourself in Queenstown with a car and a day to spare, I can highly recommend this drive along the coast. New Zealand was my April trip for the Take 12 Trips challenge (take 2!) and I’m also linking up for Monday Escapes. On our second day in New Zealand, or first full day, we got up early to return to Auckland Airport, where we got on a flight to the south island – specifically to Queenstown. Once there, we found our rental car, drove into town and checked into the hotel (we ended up at Novotel because literally nowhere else had a room available for the entire time we were there and we didn’t want the hassle of changing hotels after 2 days!). We had nothing planned for the afternoon, so we decided to just get in the car and take a drive. A map I had picked up from the airport recommended driving towards Glenorchy, so that’s what we decided to do. The map suggested that, if we had time after visiting Glenorchy, we should “drive on and find Paradise”. We did have time, and so on we drove. About 20 minutes later, after driving down some rather bumpy gravel roads and crossing a few fords, we spotted the sign for Paradise. There are a lot of sheep in Paradise! Also, toadstools, which I couldn’t resist taking way too many photos of. Does a fairy live here? We drove on for another 10 or 15 minutes, then we reached a ford that we thought looked a bit too deep for our car to cope with, so we stopped the car, got out to take some photos and then drove back the way we had come. Birds… I have no idea what kind! Once we got to Glenorchy again, instead of driving straight back to Queenstown, we decided to drive around the top of the lake. The original plan was to go to Kinloch, but one road was closed, so we turned a different way and ended up in the Routeburn carpark, at the start of the Routeburn track, so we got out and went for a short walk. The trail we took follows the Routeburn track for a little way (the entire track is 33 km!) then turns off onto a small nature loop. Our entire walk took roughly an hour, which was perfect – long enough to stretch our legs without being too strenuous. We saw lots of little birds, but none that would stay still long enough to have their photos taken! So you’ll just have to make do with more scenery, and random plants that I thought looked interesting. After our walk, we got back in the car and drove back to Queenstown for dinner, having got an excellent first impression of what the south island had to offer! I’m linking this post up for Monday Escapes with Packing My Suitcase and My Travel Monkey. New Zealand is also my March trip for 2016’s redo of Take 12 Trips, a linkup started by Clare from Need Another Holiday.